The richly textured Greek Island with its legendary Minoan history and its magnificent people are all a part of the wonder of Crete. 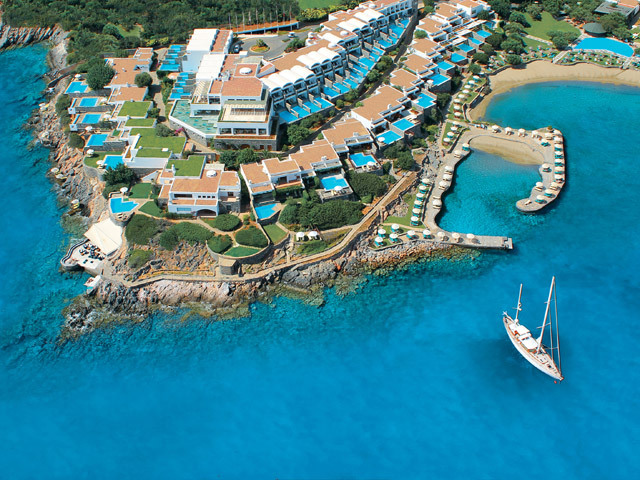 The wonder of Crete is yours when you stay in Elounda, located in the most attractive coastal region in eastern Crete. 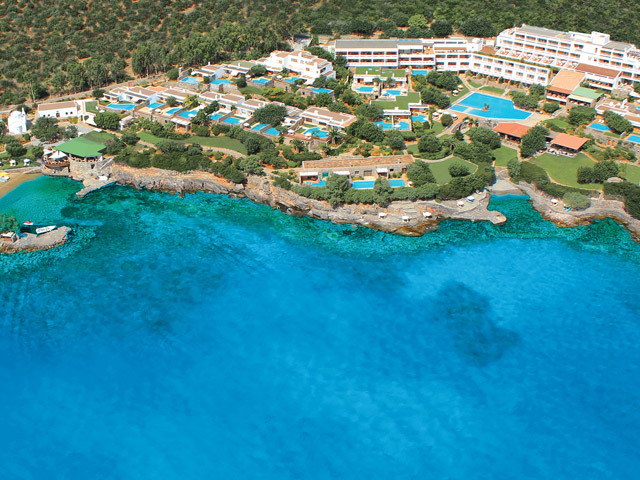 With its aqua-blue sea, dry and healthy climate it's irresistible. 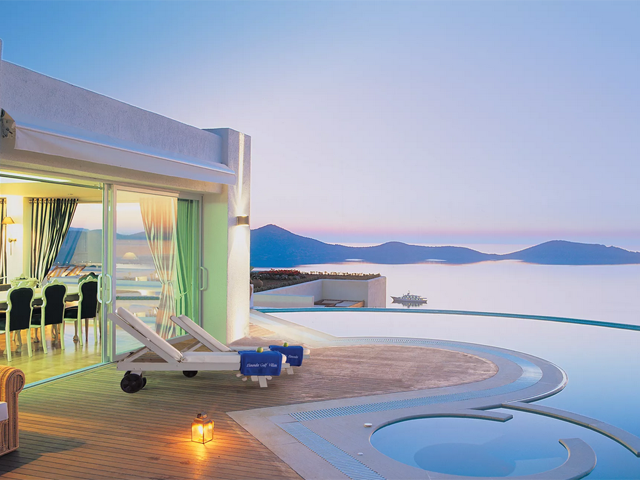 Elounda Residence is located at the most magical place in Crete island. It rises up on the hills of Elounda revealing at the guest the most imposing and breathtaking view to Mirabello’s gulf and to the historical fortress island of Spinalonga. Our restaurant offers a buffet breakfast, lunch and dinner daily. The tavern offers a wide range of Greek cuisine for lunch and dinner. At the bar and pool are available drinks and snacks. Also available children’s menu. 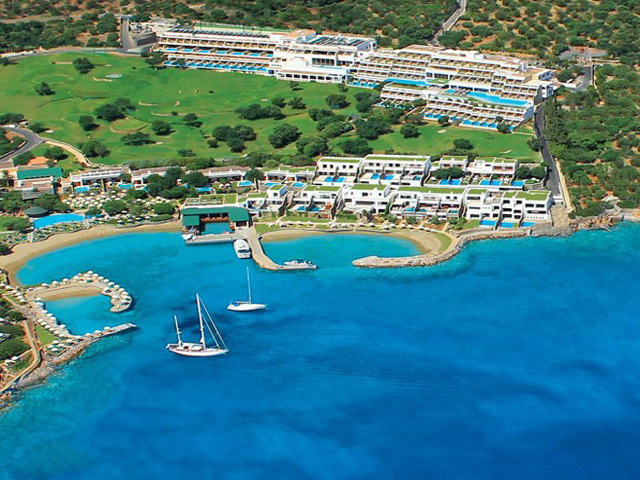 The Elounda Residence offers free Wi-Fi, Internet Corner, Games Room and a Meeting Room. Recreational and sporting our facilities include a fully equipped gym, Spa Center, tennis court, mini golf and table tennis. Also has a separate children’s pool and 2 indoor and outdoor playgrounds. Free parking is available to all our guests. The Elounda Residence is a 15 minutes walk or 5 minutes by our private mini bus from the main street, very close to beautiful beaches, local shops and boats with frequent connections to the famous island of Spinalonga all day. The Elounda Residence is a First Class Complex with Apartments and Villas each with a Private Pool, situated on a Hill, 800 m from the Center of the picturesque Harbor of Elounda and its Beach. Crete the name conjures up many images.Elounda Residence is located at the most magical place in Crete island. It rises up on the hills of Elounda revealing at the guest the most imposing and breathtaking view to Mirabello’s gulf and to the historical fortress island of Spinalonga. The hotel’s Apartments & Villas is 15 minutes walk from the centre of Elounda of Crete, in a peaceful location. Also we offer free shuttle service to and from the main street, very close to beautiful beaches, local shops and boats with frequent connections to the famous island of Spinalonga all day. Free private on-site parking is available. Standard Economy Apartment - Comfortable homely apartments with a separate bedroom and a seating-dining area with kitchen facilities included a toaster and a kettle, customary furnishing, with a balcony or terrace which offer sea view, TV, bath, air-conditioning unit, safe deposit box(extra cost), fridge, direct dial telephone and free Internet Wi-Fi. Family Economy Standard Apartment : Comfortable homely apartments with a separate bedroom and a seating-dining area with sofa bed or beds with kitchen facilities included a toaster and a kettle , customary furnishing, with a balcony or terrace which offer sea view, TV, bath, air-conditioning unit, safe deposit box(extra cost), fridge, direct dial telephone and free Internet Wi-Fi. Junior Superior Apartment : Comfortable homely open plan superior apartments with en suite bedroom and seating-dining area with sofa bed or beds with kitchen facilities included a toaster and a kettle , classic furnishing with a terrace offering a breathtaking view to Elounda Gulf and Spinalonga Ιsland, TV, DVD-CD player, hairdryer, bath, air-conditioning unit, safe deposit box(extra cost) , fridge, direct dial telephone, free Internet Wi-Fi , shopping service and mini bar on request. Superior Apartments :Comfortable homely superior apartments with a separate bedroom and a spacious seating-dining area with sofa bed or beds with kitchen facilities included a toaster and a kettle , classic furnishing with a terrace offering a breathtaking view to Elounda Gulf and Spinalonga Ιsland, TV, DVD-CD player, hairdryer, bath, air-conditioning unit, safe deposit box(extra cost) , fridge, direct dial telephone, free Internet Wi-Fi , shopping service and mini bar on request. 2 Bedroom Superior Family Apartments : Comfortable apartments with two separate bedrooms and a dining area with kitchen facilities included a toaster and a kettle, classic homely furnishing with a terrace offering a breathtaking view to Elounda Gulf and Spinalonga Island, TV, DVD-CD player, hairdryer, bath, air-conditioning unit, safe deposit box(extra cost), fridge, direct dial telephone , free Internet Wi-Fi, shopping service and mini bar on request. Grand 2 Bedroom Superior Family Apartments : Spacious comfortable apartments with two separate bedrooms and a seating-dining area with sofa bed or beds with kitchen facilities included a toaster and a kettle , classic homely furnishing with a terrace offering a breathtaking view to Elounda Gulf and Spinalonga Island,TV, hairdryer, bath, air-conditioning unit, safe deposit box(extra cost), fridge, direct dial telephone free Internet Wi-Fi , DVD-CD player , shopping service and mini bar on request. 2 Bedroom Maisonette Villa with Private Pool : Occupying an area of 90-120m2 the 2 Bedroom Pool Villas comprise of a spacious living room and dining room area fully equipped kitchen on the ground flour and two bedrooms with comfortable beds, a separate dressing room and a bathroom on the first floor. Classically furnished with a homely touch make you feel like home. The open plan kitchen is fully equipped with a two ring cooker with oven, fridge, freezer, toaster, coffee filter machine, kettle, iron board and iron. The Villa is offering hairdryer, air-conditioning unit, fridge, direct dial telephone , free Internet Wi-Fi , DVD-CD player , shopping service and mini bar on request. Complimentary offers: One complimentary 30min massage, safe deposit box, evening maid service, pool towels, en suite amenities, a bottle of wine (upon arrival) , Coffee, Tea and Sugar (upon arrival), DVD Library, late check out upon availability and for children 4-12 years old that are on HB, complimentary limited all inclusive board basis. – Main Restaurant ”Ariadne” (Buffet Breakfast, Lunch & Dinner). Menu prepared with natural ,fresh, Cretan ingredients.